Now that he has formally announced his run for President, former Senator Fred Thompson can finally behave in all ways like a candidate. He can begin to plead for votes, advertise, engage in full-fledged fundraising, and more. But in one realm of politics—the online world where the candidates are moving rapidly, voters are flocking, and federal regulations are struggling to catch up—the change may not be so dramatic. The biggest change in Thompson’s Web campaign since the announcement is a change of the url address. Formerly www.imwithfred.com, the site’s new address, www.fred08.com, demonstrates a clearer purpose. Another change is that before entering the site, visitors now face an initial invitation to “join” his campaign. Even before Thompson officially entered the race, however, the Web site of the sometime lawyer/lobbyist/politician/actor already looked and functioned much the same as those of the 17 other presidential candidates who had announced. Some critics even complained he was taking advantage of loopholes in federal law. A detailed content analysis of Thompson’s site on the eve of his entering the race found that it was already among the most sophisticated of anyone running, and still is. It exceeds all of his GOP rivals in interactivity and was notably active in fundraising. It also clearly tries to position him as a conservative heir to Ronald Reagan. Through August, Thompson was, in the technical language of the Federal Election Commission, “testing the waters,” an official status that limits what a potential candidate can and cannot do. Election regulations exempt anyone “testing the waters” from certain disclosure requirements, which also limit their fundraising, bar them from calling themselves a candidate and restrict them from advertising on television, radio or in newspapers. But the law has yet to be updated to reflect the digital domain, and when it comes to advertising even exempts it. Much of what is forbidden in the old media Thompson’s site was doing online. Indeed, Thompson has relied heavily on the Internet as a megaphone to generate buzz, gain supporters, and raise money. How developed is his online campaign? How does his “non candidate” Web site compare with those of the declared candidates? How do you run for president online when federal rules limit you from doing so in the conventional world? In June, PEJ examined the Web sites of the 19 officially declared candidates. The last week of August, PEJ conducted the same study of Thompson’s site. The content analysis found several similarities, including a clear fundraising operation and several volunteer opportunities. In addition to not using the word President, there was also something else conspicuously lacking from only his site: where he stands on any issues facing the country. Like those of other candidates, Thompson’s site offers several ways for potential voters to engage with him online and learn of his latest appearances. He has a collection of Web videos that he even brands under the menu heading, “FredCast.” He also has a blog, the “Fred File,” which invites user comments, usually upwards of 100 per post, though you must be a “friend of Fred” to view or post comments. He also has an active “newsroom” with press releases from the campaign and a collection of mainstream news articles focusing on Thompson’s unofficial bid for the presidency. It is these kinds of activities that critics argue evade the rules. Lane Hudson, known for helping publicize the e-mails from former Rep. Mark Foley (R-Fla.) in last year’s page scandal, has filed a formal complaint with the FEC. Thompson accomplished his voter involvement activities online without ever explicitly stating that he is running for president or asking for votes. He didn’t have to. Instead, the site lets his online supporters do the campaigning for him by networking with each other. Thompson’s site is also distinguished by the fact that he uses it to help citizens register to vote. In June, when PEJ analyzed the sites of the declared presidential candidates, only four of the then-19 candidate sites offered voter registration information. Not only does Thompson offer this practical feature, but he even devotes one of his ten menu tabs to it. Overall, Thompson’s site excels at encouraging users and potential voters to participate in the campaign. Of the six ways a site might invite people to actively participate that PEJ identified in the June study, Thompson offers five of them. People can add their comments to the campaign blog, they can organize fundraisers for Thompson, host events or parties, register to vote and engage with Thompson on social networking sites like MySpace and Facebook. He does not, however, offer an opportunity for users to establish their own separate blogs on his site. Compared with the 19 candidate sites examined in June, these offerings put Thompson in the second-highest category of user participation. Sharing that seat with Hillary Clinton, John Edwards and Bill Richardson, Thompson is the only Republican whose site was that user focused. In dollars raised, Thompson’s numbers online are better than his social networking tallies. According to IRS reports, Thompson raised $3.45 million in June, of which nearly a quarter ($772,000) was raised online. His home page has three different places for visitors to donate or contribute, which is about the same as other candidates. Again, the difference is that the other candidates have filed with the FEC and Thompson has not. Thompson’s site is also similar to other candidates in that it features his personal story. Thompson’s biography is broken into four sections— “Growing Up,” “The Early Years,” “Legislation” and “Fred Today”—which taken together emphasize his leadership. The five most-frequently used words in his biography are Senate, committee, American, state and Tennessee. But unlike the Republican candidates leading in the polls, Thompson does not shy away from using the word “conservative.” In June, we found that only four of the then-11 GOP candidates even mentioned the word, all together using it just eight times. Thompson’s site, in contrast, uses it repeatedly, four different times. He also leans on former president Ronald Reagan’s popularity twice to express the conservative icon’s positive influence on his politics. But when it came to where he wanted to take the country if elected, Thompson’s site was really just “testing the waters” and with only one toe. In the June study, all other candidates featured—usually across the main navigation bar—Web pages delineating their position on a host of issues. Most of the candidates highest in the early polls offered their stances on six to twelve different matters facing the country. And, all 19 candidates explained their views on the war in Iraq. This may be luxury that won’t last now that Thompson has entered the race. He will now campaign face-to-face with voters and interact with journalists, both of whom may want to know what he believes and proposes to do if elected. What is changing is that Thompson’s candidacy, and perhaps his Web site, can no longer offer the promise of the alternative candidate who has not yet fully entered the fray. Fred Thompson’s site, unlike the sites of the other 17 officially announced presidential candidates, is conspicuous in that it lacks one very important word. It does not mention the word “president.” That is because he is not officially running for president, and is therefore prohibited by the Federal Election Commission from advertising himself as a candidate. In all other visible and practical features, his site looks just like a top-tier presidential candidate Web site, complete with a video section, blog, volunteer opportunities, a biography, news and even “I’m with Fred,” graphic icons to download. 1. This term, as defined by the Federal Elections Commission, is an exemption allowed to individuals who are exploring “the feasibility of becoming a candidate” without actually declaring their candidacy and following the federal campaign regulations. This is different from an “exploratory” status that other candidates have used for extended periods. To see when the testing-the-waters exemption no longer applies, please see http://www.fec.gov/pages/brochures/candregis.shtml. 3. Since the date of our full study of the 19 officially declared presidential candidates, Tommy Thompson and Jim Gilmore have exited the race. Therefore, there are actually 17 candidates. 4. 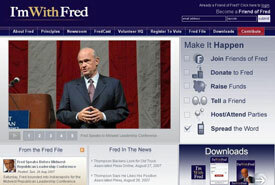 The analysis of Fred Thompson’s Web site took place on August 22-24. Content updates were monitored for the week of August 13-17. 5. In the PEJ study,“Election 2008: Candidate Web Sites, Propaganda or News?”, we identified the presence of six participatory features. We summed them to create a scale from one to six, with six being the highest. These six features include: user comments on campaign blogs, opportunity to establish citizen-initiated blogs, fundraising, community events, voter registration information and social networking sites. 6. Since the date of our full study of the 19 officially declared presidential candidates, Tommy Thompson and Jim Gilmore have exited the race. Therefore, there are actually 17 candidates.